Middleton was a long time member of Moorestown Fire Dept and Burlington County Prosecutor’s office. 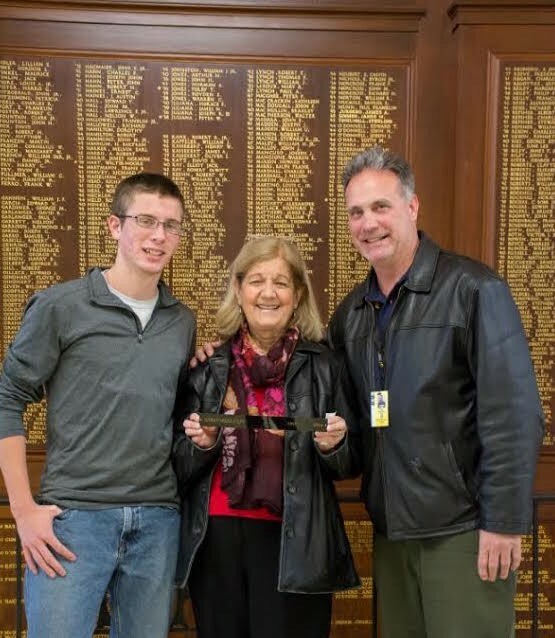 Moorestown High School senior Kevin Fox gives previous record holder Barry Middleton’s plate to Marie Middleton, Barry’s wife. Barry passed away in 2012. Pictured from left is Kevin Fox, Marie Middleton and Moorestown Boys Track coach Troy Pappas. Photo special to The Sun. Continuing the Moorestown Boys Track tradition of giving record plates to previous school record holders, Maria Middleton, wife of the late Barry Middleton, recently accepted Mr. Middleton’s plate from current record holder Kevin Fox. Middleton’s 800M record of 1:55.4 was set in 1963 and was the oldest boys track record remaining before current senior Kevin Fox broke it last season. Fox’s performance of 1:52.60 ranked him number one in New Jersey at the time. He has committed to run in college for Notre Dame University. Middleton was a long time member of Moorestown Fire Dept and Burlington County Prosecutor’s office. Middleton passed away in 2012.